No matter how you decide to take your Death Valley tour, you'll find plenty to see. You can tour it on your own using the ideas below, or opt for a guided tour with a park ranger or a tour company. You can also get a day tour to Death Valley from Las Vegas, which is an excellent way to get out of that crazy town for a little while. While Death Valley is a big national park, area-wise it only has a few roads that go straight through. Your Death Valley tour route will be more or less the same, no matter how long you have to see it. The big difference with more days is the number of stops you can make and how long you spend on each one. If you like to tour on your own and are short on time, use the guide to the top Things to Do in Death Valley, which also tells you how to see most of them in a single day. If you've got more time, try the Death Valley Driving Tour, breaking it up into two day trips: On the first day, explore from Badwater to Harmony Borax Works and a side trip to Rhyolite. On the second day, go north to see the rest of the park. If you are lucky enough to have three days or more, go even slower and take in more side trips. If you want to go to places your passenger vehicle won't take you, like Titus Canyon or The Racetrack, Farabee's Jeep Rentals is just across the road from the Inn at Death Valley. They offer free planning assistance along with your rental. Death Valley park rangers lead unique Paleontology Tours a few times a year. They're so popular that there's a lottery just to get a spot on one of them. And it's no wonder. It includes a hike through a dramatic canyon with high cliff walls opening into a multi-colored basin and a up close encounter with well-preserved fossilized tracks of bird, horse, camel, and mastodon-like creatures. Details are at their website. Rangers also host astronomy programs. When the moon is full, they take guests to explore the sand dunes or Badwater in the moonlight, watch the moonrise through binoculars. When skies are dark during the new moon, they set up telescopes and help you explore the wonder of a truly dark sky. It's only a little more than two hours' drive from Las Vegas to Death Valley. Action Tours offers a Death Valley tour in a Hummer vehicle, which includes a light off-road experience through 20 Mule Team Canyon. Well-respected Pink Jeep Tours also offers a Death Valley tour from Vegas. Finally, Bindlestiff Tours is a well-rated company that offers group tours and private, guided tours of Death Valley from Las Vegas. 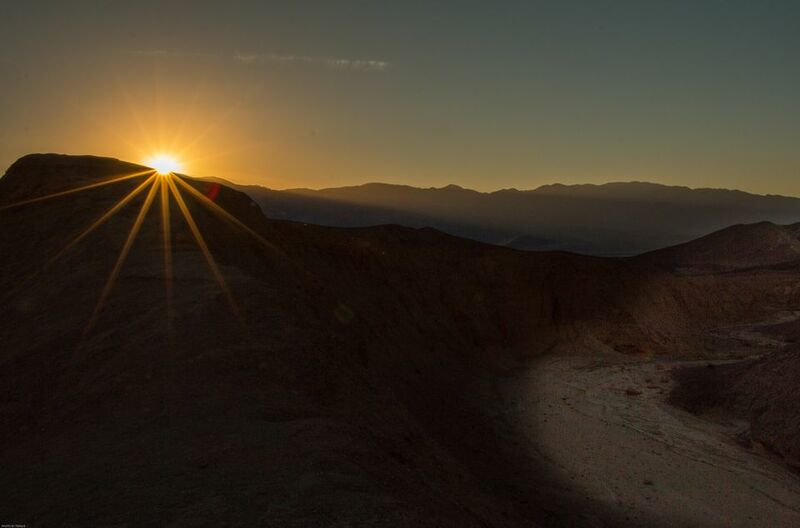 Outdoor outfitter REI offers Death Valley hiking tours. They include options to camp out or stay in a hotel. Farabee's Jeep Rentals also does group tours to Titus Canyon and Badwater. For a private tour, try Death Valley Jim, a writer, adventurer and photographer who has been focusing on Death Valley since 2011.